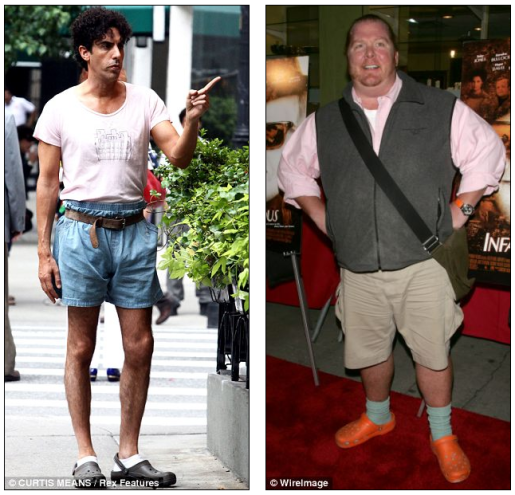 Fashion icons Sacha Baron Cohen and Mario Batali love their Crocs. I’m not a fashionable guy, but I am an opinionated guy when it comes to what people wear. I have a lot of pet peeves: I hate tights as pants, I hate Uggs, and I hate Crocs most of all. Crocs, those ugly garish rubber hospital shoes with the holes in them, are inexplicably popular. In fact, sales of Crocs topped $1 billion all time this year, which has caused the Colorado-based company to crow about its future success and its continued popularity with celebrities. I mean, I get it. They’re (probably) comfortable and they’re very easy to maintain and care for. They’re just a solid piece of rubber formed into a clog; if you get them wet or dirty, you just hose them off and wait until they dry and boom, you’ve got shoes again. That said, unless you work in a kitchen or a hospital or you’re 5, these are not acceptable public shoes. I’d rather see someone wearing flip-flops or house shoes out in public than wear a pair of Crocs. When you wear Crocs, you’re wearing a brightly-colored sign around your feet that says, “I don’t care about anything anymore.” Just go ahead and let massive, shark-eating crocodiles chew your feet off, because you’ve lost the privilege to enjoy having feet.